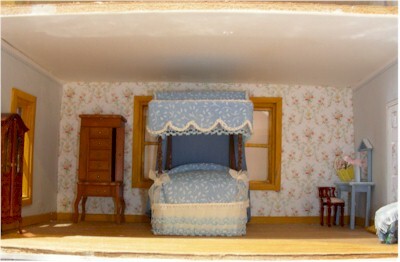 to figure out what wallpaper to use so she put furnishings in the rooms to help make the decisions. All the rooms have not been papered. Grace has used both half scale and quarter scale papers in this house. 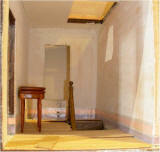 The newest photos of the rooms are at the bottom in a new table. Update: the house is now lighted, papered and floors are in. New photos below. Still working on landscaping the outside. Those photos will be posted last. Preliminary third floor Play Room, no wallpaper, no flooring. So okay, I had a major set back when I went to put the lighting in. I had two shorts in the system. Found one but could 't find the other. Had to get help from Jim. In the process, I had to pull out all the wallpaper and flooring that was already installed. Now, I've got the lights in and working and all the floors and paper are now back in. I changed wallpaper in a couple of rooms. Deck Ann Bramlet and I are thinking about offering a deck kit in half scale. Will let you know if that happens. 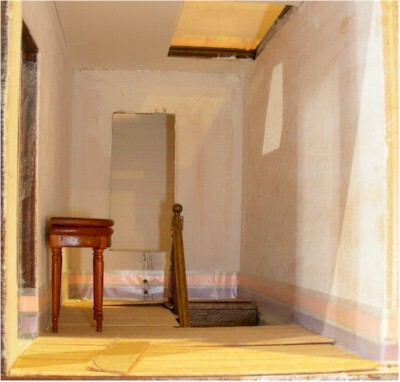 Below are photos of the individual rooms from the top to the bottom of the house. Once the house is furnished, I'll have updated photos of furnishings and landscaping.. I changed the color of the floors and counters in the bathroom on the third floor. 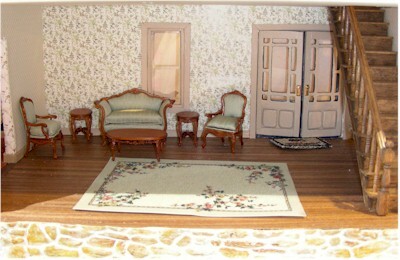 Playroom on third floor. I changed the paper in this room too. Also refurnished the stair rails to match the floor. Bedroom 3 on the third floor. Might also make a sewing corner in this room. Not sure yet. Bedroom 1 on second floor. I changed 2 walls of the paper in this room. I like it much better. Bedroom 2 on second floor. Hall and office on second floor. Study - game room on second floor. Conservatory on first floor. Wish I'd put the electric on the corner instead of the middle. Might try to change it so the wire is at the bottom? Living room on the first floor. Dining room on the first floor. 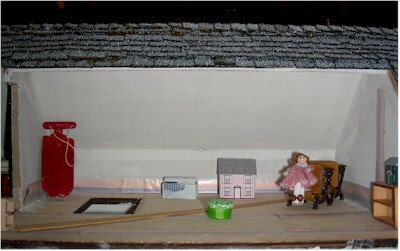 Half Scale Farmhouse - "Heavenly Harvest"
Will have to make a sign for it now. Thank you to all the half scale swappers for the accessories over the years. Many found their way into this house. I wanted to feature the Baby House in this project. You can just see the cabinet under the stairs. There is a clock and vase on the cabinet. Living room with baby House open. The conservatory shows off the families musical talents. 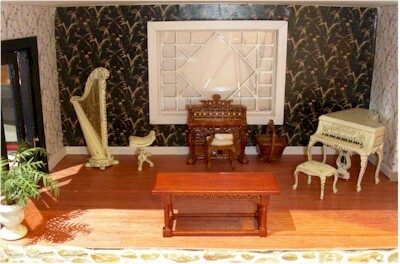 The harp, organ and the grand piano. The girls are chatting about the concert they are getting ready to put on. 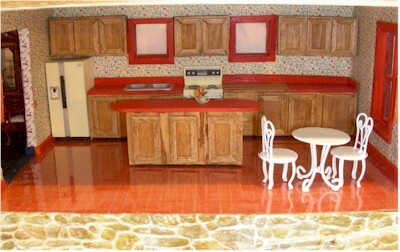 This Half Scale Baby House is in the living room of the farm house. 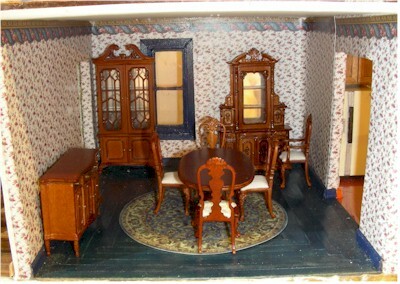 I posting photos of it up close and personal so you can see that it is furnished. 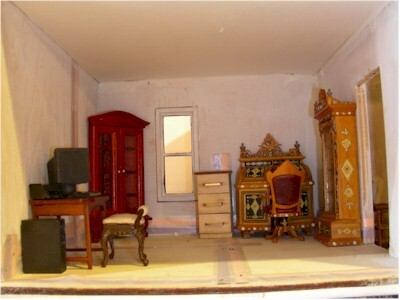 Getting furnishings that small was a challenge! 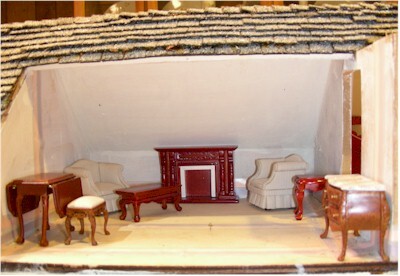 These two photos are a little larger than I like to use on my site, but think they need to be larger so you can see the details Be sure to click on the Half Scale Baby House and look at the details. Grace made the blue dining room floor, one strip at a time. Put is down on Stick Um then used the other side to hold it down. The Dining Room where they are getting ready for a party. The view of the kitchen. Second Floor - First Bedroom 1 Finally found a home for this wonderful bed that I've never had a place fancy enough for before. Second Floor - Office The office desk is full of little items. Almost every shelf is full of something. Notice tarot cards and crystal ball on the game table. .
Bathroom on Third floor. The man? It's a man thing to read the newspaper in the bathroom. Had fun getting his pant on around his ankles. Third floor bedroom occupant collect shells. There is a complete shell collection in the cabinet. Play room is full of dolls and toys. Many gotten over the years in the half scale swaps. 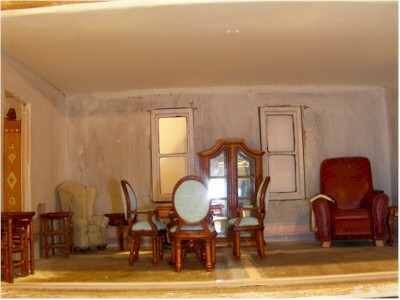 In fact many of the little accessories that make up this house are from the half scale swaps. Maybe you'll see something you made? 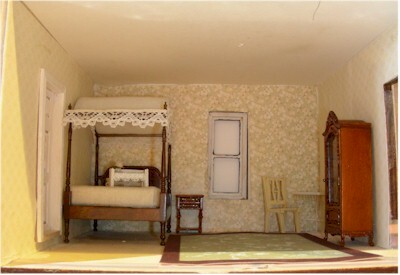 The occupant of the bedroom below collects dolls. The Deck - There are embers glowing in the grill. Click on the photo and see if you can see them. Several dogwood trees are growing around the yard. Birdhouses from the HS swaps.